The view of America's top commander in Afghanistan, General Stanley McChrystal, is now well-known: without additional troops, the U.S. mission in Afghanistan will fail. President Obama has not yet signaled whether he is willing to commit more troops, but General McChrystal, whose confidential report to the President leaked to the WASHINGTON POST, seems to leave President Obama with an unambiguous choice. Rory Stewart, director of the Carr Center for Human Rights at Harvard Kennedy School of Government, joined guest host Lynn Sherr on BILL MOYERS JOURNAL to provide an alternate set of options. Stewart, who served in the British military and foreign service, walked alone across Afghanistan shortly after the U.S. invasion. During his 6,000 mile journey from Turkey to Bangladesh, Stewart stayed in small villages few foreigners reach  to better understand the region and its people. Stewart currently runs the Turquoise Mountain Foundation, an organization based in downtown Kabul devoted to restoring the city's urban center and indigenous crafts. He has advised Secretary of State Hillary Clinton, U.S. Special Envoy Richard Holbrooke and testified before the Senate Foreign Relations Committee. Stewart tells Lynn Sherr that the language President Obama has used to frame the conflict in Afghanistan artificially narrows America's  and the international community's  options in the region. Consequently, in Stewart's opinion, the McChrystal report is the military's answer to the wrong question: what would it take to defeat the Taliban? He explains, "I think the President has defined a very, very narrow objective. He's said that we're there to do counter-terrorism. That's what he's been saying since January. But then he said in order to get there, we need this huge project, which amounts really to building a state. That's all dressed up in this language of counterinsurgency, fighting the Taliban." According to Stewart, this is a dangerous conflation of goals, "So, the problem is that these are all quite different objectives. In and of themselves, they're fine, but they're not connected, necessarily, in the way the President thinks. There's a huge theory that everything that we want to do is somehow connected. The stability of Pakistan. The security of the United States. Beating the Taliban. Beating Al Qaeda. Bringing development to the Afghan people. But we end up in a bit of a muddle, because we tend to be pursuing five objectives at once, assuming that they all amount to the same thing." The catch, Stewart goes on to say, is that "some of these things just may not be possible." That doesn't mean Stewart thinks the U.S. and international community should withdraw from Afghanistan  just the opposite. If the true goals of the administration are to prevent another terrorist attack on the United States and help the Afghan people, Stewart believes a more modest, sustainable approach is needed. People aren't going to put up with over 100,000 troops on the ground and this level of casualties forever. So, probably better for us, better for the Afghans, would be to step back and say, "Hey, we're not going to try to do all this stuff. We've got two very limited objectives. We'd like to make sure that Al Qaeda doesn't significantly increase its ability to harm the United States. And we'd like to do something for the Afghan people. And we recognize that doing those things is a very long term process, and so, we probably need fewer troops, not more." >>Read Rory Stewart's article about Afghanistan in the LONDON REVIEW OF BOOKS, "The Irresistible Illusion." Rory Stewart, the Ryan Family Professor of the Practice of Human Rights, is the director of the Carr Center for Human Rights Policy. Stewart is the founder and chief executive of the Turquoise Mountain Foundation, which is investing in the regeneration of the historic commercial center of Kabul, providing basic services, saving historic buildings and constructing a new bazaar and galleries for traditional craft businesses. Stewart was born in Hong Kong and grew up in Malaysia. He earned his BA and MA in Modern History and Politics, Philosophy and Economics from Balliol College, Oxford University, served as an officer in the British Army, and worked for the British Diplomatic Service in Indonesia, Montenegro and elsewhere, before taking two years to walk from Turkey to Bangladesh. 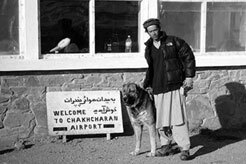 He covered 6000 miles on foot alone across Afghanistan, Pakistan, India and Nepal  a journey described in his book THE PLACES IN BETWEEN. In 2003 he started working for the Coalition Provisional Authority (CPA) in Iraq as deputy governorate coordinator (Amara/Maysan) and senior adviser and deputy governorate coordinator (Nasiriyah/Dhi Qar). In recognition of his service in Iraq, he was awarded the Order of the British Empire (OBE) by the British Government in 2004. He wrote OCCUPATIONAL HAZARDS: MY TIME GOVERNING IN IRAQ, published in the United States under the title THE PRINCE OF THE MARSHES, describing his experiences with the CPA. Rory spent the 2004-05 academic year at Harvard Kennedy School as a fellow at the Carr Center. He has also written for the NEW YORK TIMES MAGAZINE and the LONDON REVIEW OF BOOKS, among other publications. >>Read an excerpt from THE PLACES IN BETWEEN here. >>Read an excerpt from THE PRINCE OF THE MARSHES here. "General Calls for More U.S. Troops to Avoid Afghan Failure"
By Eric Schmitt and Thom Shanker, NEW YORK TIMES, September 20, 2009. By Ann Scott Tyson, THE WASHINGTON POST, September 1, 2009. "Fake Afghan Poll Sites Favored Karzai, Officials Assert"
By Dexter Filkins and Carlotta Gal, NEW YORK TIMES, September 6, 2009. "Eight years after 9/11, Taliban roils 80 percent of Afghanistan"
By Aunohita Mojumdar, CHRISTIAN SCIENCE MONITOR, September 11, 2009. By Elizabeth Rubin, THE NEW YORK TIMES, August 4, 2009. Complete coverage of Afghanistan in the NEW YORK TIMES. THE ECONOMIST, August 20, 2009. "Turquoise Mountain is investing in the regeneration of the historic commercial center of Kabul, providing basic services, saving historic buildings and constructing a new bazaar and galleries for traditional craft businesses." By Rory Stewart, THE LONDON REVIEW OF BOOKS, July 9, 2009. "The 'Good War' Isn't Worth Fighting"
By Rory Stewart, THE NEW YORK TIMES, November 22, 2008 . By Rory Stewart, TIME MAGAZINE, July 17, 2008. By Rory Stewart, THE LONDON REVIEW OF BOOKS, March 31, 2005. "Can Rory Stewart Fix Afghanistan?" By Paul Kvinta, NATIONAL GEOGRAPHIC, September 10, 2009. Rory Stewart, director of the Carr Center for Human Rights Policy, lays out an alternate strategy for the international community in Afghanistan. Kavita Ramdas, president and CEO of Global Fund for Women, the largest grant-making foundation focused exclusively on women's rights issues talks about human rights initiatives around the world. Just where does the majority stand in terms of health, education, safety, money and power? Explore and share JOURNAL coverage of Iraq and Afghanistan and the war at home in a special video collection.